The Keil MCBSTR730 Evaluation Board allows you to generate and test application programs for the STMicroelectronics STR73x microcontroller family. With this hands-on process, you can determine the hardware and software requirements for current and future product development. 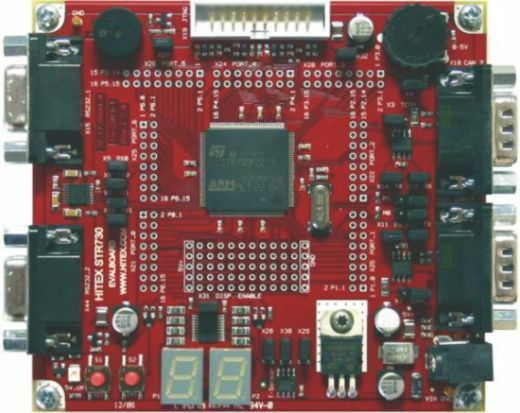 The MCBSTR730 Evaluation Board is identical to the HITEX STR730 EVALBOARD. The Keil toolchain provides extensive example projects for the STMicroelectronics STR73x device series that run on the MCBSTR730 Evaluation Board. The MCBSTR730 Evaluation Board ships with the STR730FZ2. This device is a superset of several other device variants of the STR73x microcontroller series. The MCBSTR730 Board contains all the hardware components required in a single-chip STR7 system.